» Characters from DFW #13: HUGO OAKES, LAWYER-DETECTIVE — by Monte Herridge. Characters from DFW #13: HUGO OAKES, LAWYER-DETECTIVE — by Monte Herridge. #13. HUGO OAKES, LAWYER-DETECTIVE, by J. Lane Linklater. One of the precursors of Erle Stanley Gardner’s series character Perry Mason the attorney, the Hugo Oakes series is fairly entertaining. J. Lane Linklater created this series about a criminal defense attorney who solved crimes. 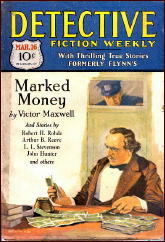 He appeared in twenty stories in Detective Fiction Weekly from 1929-1934, a respectable run. J. 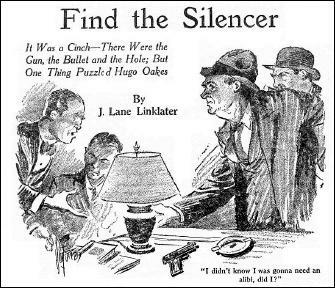 Lane Linklater was the pseudonym of Alex Watkins (1893?-1983?). He had two other series that also ran in the magazine: Sad Sam Salter (1937), and Paul C. Pitt, a kind of conman (1936-1941). He wears a slouch hat, and rolls his own cigarettes. Very little information is given about Oakes’ background and upbringing. There is a mention by Oakes himself on one occasion that he liked horses because he grew up on a farm (Not One Clew). Oakes is not one of the high-priced lawyers with a fancy office and furniture. He has a shabby office that costs him twenty dollars a month, and often doesn’t have enough in his business accounts to pay that. His only employee is Mamie, who is his combination stenographer-bookkeeper-secretary. The reason he has very little money is that people rarely paid him for the legal work he did for them. Oakes has a thriving practice helping people with little money out of trouble. He did his own detective work rather than hire a detective agency to do it for him. However, we must remember that these stories take place during the Depression, when many people either lacked jobs or had poorly paying ones. Oakes is an egalitarian, preferring regular people and the poor to the better off and wealthy classes. A person’s lack of money never affected Oakes’ decision to take them on as a client. Each story usually involves Oaks being called in by a client and then having to solve a murder, usually to save the client. Once his client was a murder victim before Oakes could reach the scene. Inspector Mallory was always on hand at the scene of the crime. Mallory either does not understand what is going on, or seeks the simplest explanation (always wrong, of course). Very rarely did Mallory actively ask for Oakes’ help on a case. One special case was in the story “A Pair of Shoes”, where Mallory asked for assistance. A rich businessman had disappeared, and three weeks of work had led Mallory to be desperate enough to ask for unofficial help. Oakes gets to work and very quickly solves the case in a logical manner. 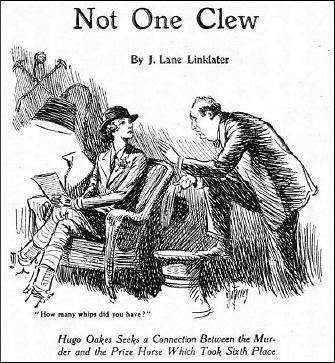 Another request for help from Mallory led to a murder investigation by Oakes at a high society horse show in “Not One Clew”. Oakes said he did not care for society, but he did like the horses. Part of the deal with Mallory was a free ticket to the horse show. 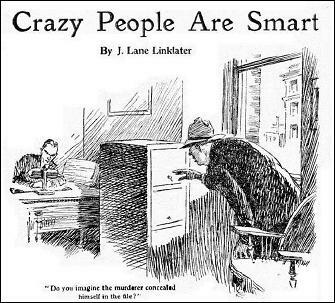 Another off-beat story for the series is “Crazy People Are Smart,” where Oakes accepts the challenge of a prison chaplain and investigates an old murder. Bill Tubby had just twenty-four hours before his scheduled electric chair execution for a crime he claimed he did not commit. Inspector Mallory had solved the case to his satisfaction, and he is afraid Oakes will do something to change the outcome. Oakes goes to the scene of the crime and investigates, coming up with an unusual solution that saves Tubby. Inspector Mallory knows about this system, and in this story attempts to use it himself. Unfortunately he chooses the wrong person as the murderer, and Oakes has to straighten him out. This is one case where Oakes becomes involved because the victim was a friend of his. Oakes is uncharacteristically not in his usual cheerful mood; in fact he is angry and unsmiling. So Hugo Oakes is a believer in the application of psychology to crime-solving. The stories contain little violence, though one exception is in the story “Finishing Touches.” Here Oakes confronts the guilty party and has Inspector Mallory secretly back him up, which is needed when the murderer attempts to kill Oakes. Mallory wounds the murderer and saves Oakes’ life. The series is interesting to read, although there are not any great criminal masterminds, fancy destructive gadgets, or gangs of criminals running around. It took all kinds of stories in the pulp era, and this series is better than many other series in DFW. You can’t mean me, cap’n? We’ll avoid the statistical as far as possible and get down to the vital. I have lived more or less decidedly and existed more or less uncertainly, in Washington, Oregon, California, Arizona, New Mexico, Texas, and Louisiana; that is, down the Pacific Coast from British Columbia to the Mexican border, and across the south to Louisiana. Thus it will be seen that I have never set foot on any but a coast or border State. I have held down — sometimes for a very brief period — forty-three jobs, in offices, restaurants, hotels, boarding houses, and again in offices; in large cities, small towns, construction and logging camps, in green valleys and desert plains. If I was working in a town, it was never far away from a restaurant; if in a camp, it was never very far away from the cookhouse. Incidentally, the transition from job to job was at times sudden and drastic. On one occasion, for instance, I was night porter in a “coffee and” dump, and a week later I was head bookkeeper for a chain store system some two thousand miles away. Honestly — or perhaps I should say, actually — I am a very fair bookkeeper. While I’m on the question of jobs — and what is more important? — I might add that the last regular job I had, and the one I was on longer than any of the others, was as editor of a farm paper. I was never better fitted for any job than for this one inasmuch as I had never in my life touched my hand to a plow and couldn’t tell the difference between a Jersey heifer and a Shorthorn bull. Now I know what a Shorthorn bull is, having met one in a dissatisfied mood. Among the people I have met and become friendly with — and this is vital, from the point of view of both life and letters — were bankers, labor agitators, gamblers, ministers, politicians, hoboes, Chinese cooks, mining-stock promoters, hard-working bohunks, and waitresses. Of these I should say that the bohunks were the most useful, the hoboes the happiest, the Chinese cooks the most successful, and the waitresses the most interesting — to me. Perhaps the most accurate indication of the kind of life a man has led is where he has slept. Well, I have slept in very expensive hotels — when I was working there — in middle-class hotels, in cheap hotels, and in fifteen-cent flophouses; also in bunk houses, ditches, city parks, fields, woods and swamps. Of these I should say that the woods were the most comfortable and the flophouses the most interesting. I have never been arrested. This I now regret exceedingly. I have had several opportunities, although I never offended society very seriously, except by going broke. I have been accosted on the street around three o’clock in the morning in San Francisco, Los Angeles and New Orleans and other minor municipalities which suspected that my financial status warranted my arrest as a vagrant. Their suspicions were correct, but I was always able to convince them otherwise. As I say, I now regret it. I may yet overcome this disadvantage. In these emergencies my tongue was assisted by my face, a deceptively mild arrangement that never seemed to fit the role of roving mendicant. I have been mistaken for a well-known Methodist minister in Portland, Oregon, and for a Chatauqua lecturer in Sweetwater, Texas. My formal education, unfortunately, was not very extensive. However, I have read rather incessantly, if not systematically. Meditating upon what I had seen and what I had read I decided, about a year and a half ago, to forsake the discussion of ton litters and live stock diseases for the production of fiction. I inquired about it. I read the writers’ journals. I asked advice of people who know about these things — I was always keen for advice. They all told me to hang on to my job for five or perhaps ten years, the while I tried to write fiction. I thereupon quit my job cold. Advice is fine, but I have always thought that if you’re going to do a thing, the thing to do is to go ahead and do it, sink or swim. I’m not rich yet, but the wife and I are going back down to California for the winter. I have never been well enough to undertake anything violent, and never sick enough to take to my bed. It is a condition that presages a long life. Under the head of more good luck, I have a wife — acquired about eight years ago — who is a good scout and a smart woman; a father and mother, both alive and well, who are intelligent and good natured—they had to be to put up with me—and a number of friends who stick through the years. All of these things count. Not that it matters, but I am now thirty-six years old. 11. INSPECTOR FRAYNE, by Harold de Polo. 12. INDIAN JOHN SEATTLE, by Charles Alexander. They’re all from 1936, so none are in this Hugo Oakes series. Later in his career Linklater turned to writing hardcover mysteries. He wrote seven of them between 1947 and 1969, all of them featuring California PI Silas Booth, along with two assistants, Gus Keyes and Daisy Gunn (who may or may not appear with him in all seven). I’ve never read one of his books, though I kept meaning to. I wonder if Bill Deeck ever did. I’ll have to look into that. Bill Deeck may or may not, but I have. THE BLACK OPAL is the best of the Silas Booth novels in my opinion, but all are readable and enjoyable if you don’t expect too much. Pure pulp in the best sense of the term. Linklater wasn’t among the upper echelon of pulp writers, but he knew how to tell an entertaining story. Thanks, Steve, for the information about the detective series Linklater wrote. I will have to look for them. Can you give me the titles of them? Offlist, if you wish. Linklater was another author who wrote quite a few stories for the pulps during the thirties and forties, mainly in the shorter length. I remember he wrote for the Thrilling Group of pulps, especially POPULAR and THRILLING DETECTIVE in the 1940’s. A complete listing of his short work would number at least a couple hundred stories. All this information should spur people to read something by Linklater, which I never have. One question re Hugo Oakes: is he ever seen in action in court? The only Linklater read here is a very short story in an anthology, “Blind Date” (1945). This is a suspense tale with a twist at the end – not a mystery solved by a detective. It has the sort of working class ambience described in the above article. Thank you for a really informative review! I don’t believe any of the stories show Hugo Oakes in court. He always seems to be on the scene of a crime, doing his work there.